Tony Sagami writes: You've probably never heard of the Canton Fair, but it is the largest trade fair in the world, where thousands of manufacturers, businessmen, and merchants gather to conduct business. The Canton Fair is co-hosted by the Ministry of Commerce of the People's Republic of China and the People's Government of Guangdong Province, and organized by the China Foreign Trade Centre. Also known as the China Import & Export Fair, the Canton Fair has been held in the spring and fall since 1957 and has the largest assortment of products, the highest attendance, and the largest number of business deals made at any trade show on the planet. 22,000 exhibitors and 200,000 buyers from more than 200 countries gather in Guangzhou (formerly known as Canton) to find everything from industrial products, textiles and garments, medicines and health products, gifts, and consumer goods. At the most recent fair, a total of $38.2 billion worth of goods were ordered, accounting for a whopping 25% of China's entire annual export total. 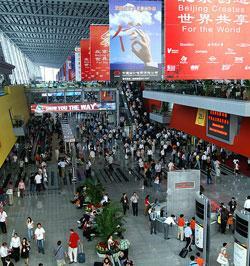 The Canton Fair is simply the single most important business event of the year. Hey! Somebody needs to tell the businessmen at the Canton Fair that the world is falling into a deep global recession because the businessmen in attendance are too busy making money to listen to what the “experts” from Wall Street and CNBC keep telling us. Get this: The number of exhibitors at the Canton Fair hit 53,000, 10% more than just six months ago. The reason is simple — the export business is still booming. According to the Ministry of Commerce, China's exports rose 22.3% to $1.07 trillion during the first three quarters of this year. In September alone, exports rose by 21.5% a year earlier and China boasted a trade surplus of $29.3 billion. At the most recent Canton Fair, $38.2 billion worth of goods were ordered — a whopping 25% of China's entire annual export total! “Export figures do not seem to be very discouraging now,” confirms Zhang Yansheng, director of the International Economic Research Institute of the National Development and Reform Commission. “China's economic fundamentals are still strong, so are exports,” Yao Shenhong, a Ministry of Commerce spokesman concurs. Example: Haier Group, the largest appliance manufacturer in China, reported a 10% increase in foreign sales in the first nine months of the year. Of course, the good fortune isn't universal. What is happening is that Chinese exports to the U.S. and Europe are rapidly slowing, but exports to its Asian neighbors, Russia, Latin American, Africa, and the Middle East are skyrocketing. It may sound ironic, but exports to developed countries are plummeting but exports to emerging markets are soaring. The reason for the dichotomy is simple: Developed countries are sitting on billions of quasi-worthless mortgage bonds, while emerging market countries never had enough money to invest in the toxic bonds our Wall Street alchemists created, packed, and peddled. China, for example, has a closed financial system that severely limited how many Chinese companies, banks, and governmental agencies are allowed to invest in foreign securities. China simply doesn't own a meaningful amount of our crappy mortgage bonds. Even Chinese consumers are in solid shape. The total household debt as a percentage of GDP in the U.S. is more than 100%, but is only a meager 13% in China. The result is that for the first time that I can remember in my 30-year investment career, the risk of investing in the developed countries is higher than investing in emerging markets. Step 1: Use rallies to reduce your U.S. holdings. The market has been very volatile, but volatility can be your friend if you use big dips as buying opportunities and big rallies as selling opportunities. That is exactly what I did last Monday when the Dow Jones soared by 936 points and I trimmed my U.S. holdings. 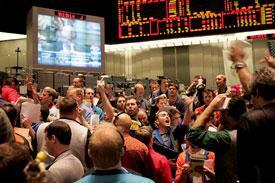 Make the most of market volatility by buying on big dips and selling on big rallies. Step 2: Dump the station wagon for a Ferrari . Given the choice of hitching your investment wagon to a slow jalopy headed for the junk yard or a 200-mph high-performance sports car … I'll take the faster ride every time. I suggest the same for your portfolio and recommend that you overweigh your portfolio with stocks, funds, and/or ETFs from Asia, Latin America, and the Middle East. Step 3: Buy yourself some “haywire” insurance. I've been saying this for a long time, but I'll say it again: I expect the U.S. economy and the U.S. stock market to get ugly. If things do get ugly, the best haywire insurance you can buy is gold, gold stocks, or gold funds. Lastly, the one thing that you should NOT do is do nothing. Don't let the volatility turn you into a deer-in-the-headlights investor who is too frightened to do anything. Doing nothing has been a very costly strategy in the last month and I expect the cost of inaction to go even higher.